A talented Hastings United Football Club player has been invited for a trial with Leeds United. Young midfielder Adam Lovatt will be heading to the Sky Bet Championship high-flyers for a five-day trial starting on Monday December 3. 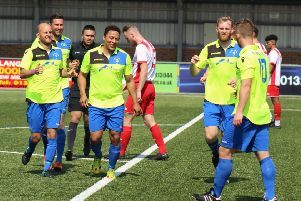 As reported by www.hastingsunited.com, Lovatt has generated a lot of interest from numerous clubs due to his consistent and improving performances during the second half of the 2017/18 season and in the current campaign. All at the club wish Lovatt well in his forthcoming trial and are very pleased that one of its young players has attracted the attention of a club of Leeds United’s calibre. The club feels it is certainly on the right path in terms of developing young players via its football academy managed by Skiltek and through its education and football partnership scheme with East Sussex College Hastings. Lovatt has been a key part of a Hastings side which lies second in the Bostik League South East Division with 10 wins out of 12. Hastings face back-to-back away games against Faversham Town today (Saturday) and Whyteleafe on Tuesday night.